Antex Exterminating can help you eliminate the rodents in your home and restore your house to the comfortable, healthy, safe place you deserve. We provide free, no-obligation rodent control quotes in North Carolina, including Asheboro, Sanford, Fayetteville, Rockingham, Fort Bragg, Lumberton, Hope Mills, Clinton, Laurinburg, Raeford. Call or e-mail us today! Call for a FREE rodent control estimate today! 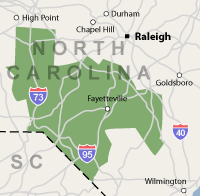 We service North Carolina, including Rockingham, Fort Bragg, Lumberton, Hope Mills, Clinton, Laurinburg, Raeford, and surrounding areas.